Advanced intelligent networks (AIN's) are telecommunications networks that are capable of providing advanced services through the use of distributed databases that provide additional information to call processing and routing requests. In the mid 1980's, Bellcore (now Telcordia) developed a set of software development tools to allow companies to develop advanced services for the telephone network. The advanced intelligent network (AIN) is a combination of the SS7 signaling network, interactive database nodes, and development tools that allow for the processing of signaling messages to provided for advanced telecommunications services. The AIN system uses a service creation environment (SCE) to created advanced applications. The SCE is a development tool kit that allows the creation of services for an AIN that is used as part of the SS7 network. A service management system (SMS) is the interface between applications and the SS7 telephone network. 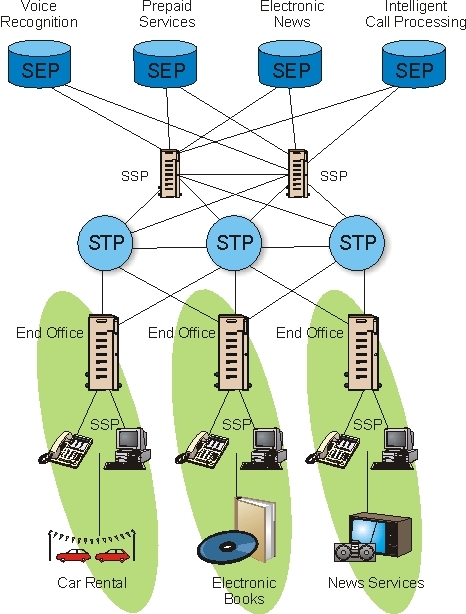 The SMS is a computer system that administers service between service developers and signal control point databases in the SS7 network. The SMS system supports the development of intelligent database services. The system contains routing instructions and other call processing information. To enable SCPs to become more interactive, intelligent peripherals (IPs) may be connected to them. IPs are a type of hardware device that can be programmed to perform a intelligent network processing for the SCP database. IPs perform processing services such as interactive voice response (IVR), selected digit capture, feature selection, and account management for prepaid services. To help reduce the processing requirements of SCP databases in the SS7 network, adjunct processors (APs) may be used. APs provide some of the database processing services to local switching systems (SSPs). This figure shows the basic structure of the AIN. Companies that want to enable information services use the SMS to interface to SCP databases within the SS7 network. This diagram shows how a prepaid calling card company manages information in a signaling end point (SEP) database. The SEP database communicates to the SS7 network through a SSP. SCE tool kit. The SEP is connected to an interactive voice response (IVR) unit that prompts callers to enter the personal identification number (PIN). The IP then reviews the account and determines available credit remains and informs the SS7 network of the destination number for call routing.